Amanda Shelton is clever, adventurous, and tough - and she's going to have to be, because she just crash landed on a world where her saviors might really be her enemies. It takes fierce determination to prevent the people of this frightening and unfamiliar place from stealing her shuttle technology, or from imprisoning her while they do it. Yet what she knows could save countless innocent lives - including those who keep this world safe. Facing this terrible test of spirit will take everything Amanda has.... If she survives at all. Amanda Shelton was part of a space crew on an interplanetary shuttle when their ship encounters a spatial rift and crash lands on an unknown planet. The only survivor, she finds herself a captive of Prince Paxton and soon discovers he is interested in her technological knowledge to aid him in his country's current war effort. Forced to learn their language, Amanda quickly realizes that this society has no respect for women and can only dream of returning home. The story opens and closes six years into the future with a small boy begging Amanda, his mother, to tell him the story, a style reminiscent of The Princess Bride. As a fan of this author's cozy mystery series, I was hesitant to try this fantasy/sci fi tale, but I absolutely loved the story of this modern woman coping in a strange universe...a universe filled with poverty, strange food and animals, different customs and male chauvinists. 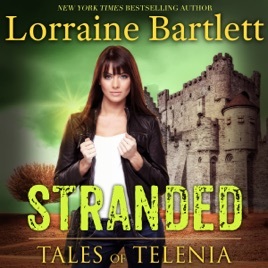 I already downloaded the next book in this series and can't wait to learn more about Amanda and her adventures in Telenia. Note: This book has been reissued and retitled as Stranded.